Ready for some easy and festive Christmas finger food ideas? Even though I just got my fall decorations up two days ago, I figured I'd better start in on our Christmas planning. I'm determined to have a fun, festive, and relaxing holiday season this year! 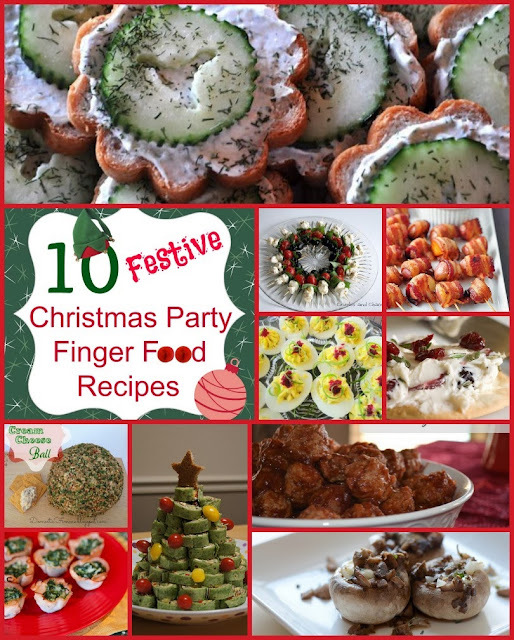 I've found a handful of yummy finger food ideas to try. Let me know if you try any of these as well! I featured these Cucumber Dill Flowers last spring for St. Patrick's Day---but they really are a great appetizer for any time of year! Bubbly Nature Creations featured this easy, low-calorie snack. Don't her 75 Calorie Stuffed Mushrooms look excellent? A friend of mine in Oregon used to make these for Bunco night. They were so easy and delicious! 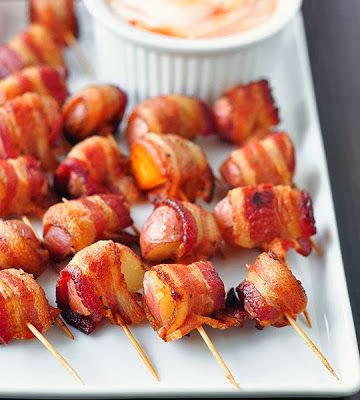 Check out these Bacon-Wrapped Potato Bites from Cook'n is fun. 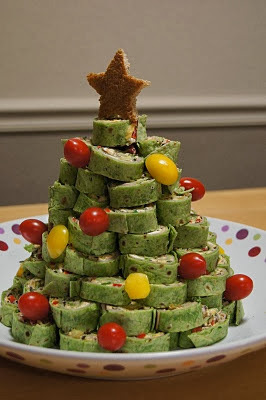 TiramiSusie's showed off this adorable display of Southwestern Pinwheels stacked to look like a Christmas tree. Cute! 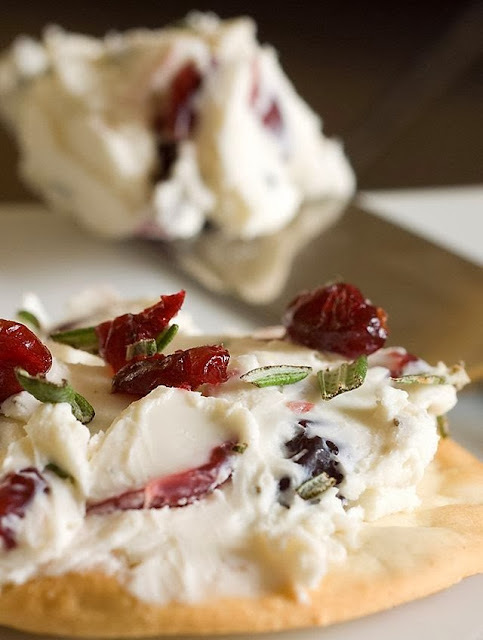 Isn't this a gorgeous photo of this Rosemary and Cranberry Spread from Life's Ambrosia? Before I even read the ingredient list, I was dying to try the recipe just from the beautiful picture! 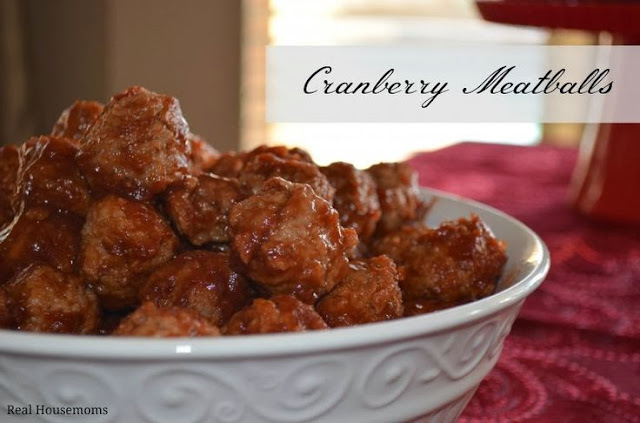 Real Housemoms featured this yummy dish, Cranberry Meatballs. I haven't done meatballs very often for my big family but I think I'm going to give them a try. I know they'll love these! 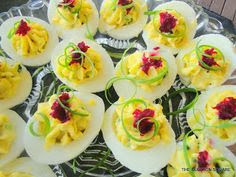 Deviled eggs are one of those non-candy foods that I can eat like candy. Oh. My. Don't these from PetitChef make you want to go make up a plate or two? Or three? 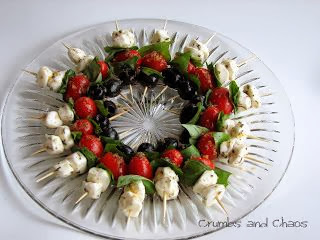 Crumbs and Chaos posted these pretty Mozz-Tomato-Olive Skewers. Beautiful presentation and great festive colors! Another one of my favorite foods is crackers and cheese spread. 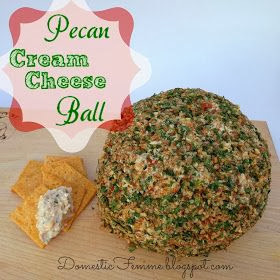 This festive Pecan Cream Cheese Ball looks delicious. Thanks to Domestic Femme for posting her recipe and encouraging us to stay away from those store-bought "mystery balls". Ha! 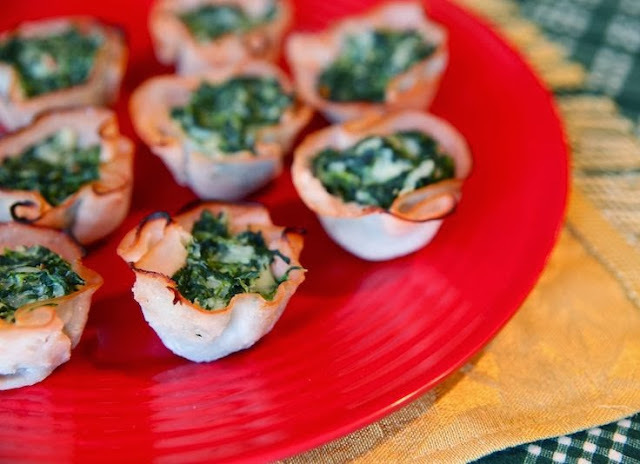 Finally, I just think these Turkey-Spinach Cups from Taste of Home are genius. What a great way to get the cute tart shape that is so neat for appetizers without having to use bread. Perfect. Well, there you have it! 10 great Finger Food ideas for your holiday snacking needs. Do you have any others that you want to add to the list? Link them up in the comments below! Make sure to check out these 10 Festive Sweet Treat Recipes, as well! 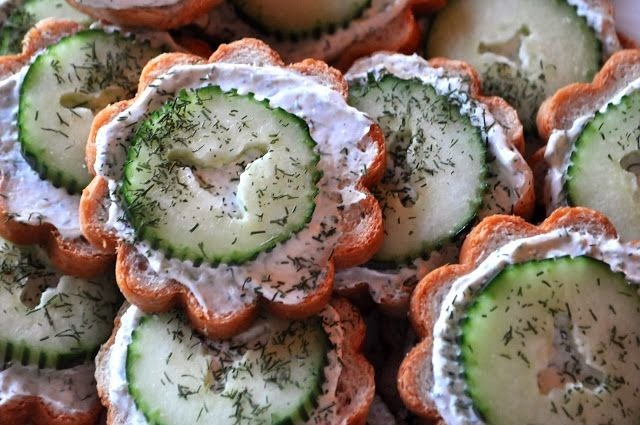 My husband's Aunt makes the little cucumber sandwiches for almost everything get-together. Yum. I've made the Cranberry Meatballs before. They are sweet so you can't eat too many! I like to serve noodles with them, if you're having them as a main dish, to cut the sweetness. Can't say I've tried any of the others, but the Rosemary and Cranberry Spread would be at the top on my list! Hope you all are doing well after such a long distance move. Thanks Sarah, for putting this all together in one place. I Pinned a few of them in hopes that I will try them. Thank you SO much for featuring my Pecan Cream Cheese Ball :) It is so addictive! You're very welcome! It looks delicious! These all look so delicious and so fun for the holidays! I love the pinwheel Christmas tree! So cute! A great and tasty idea. During the holidays, we tend to get too much rich food and these would be so much healthier. Wishing you and family the best of holidays. Two thumbs up for including real food not just candy! I have a Christmas party coming up next week and I think I might have to try one or two! My daughter and I were just brainstorming ideas for Christmas Eve finger food, so the timing of this post is EXCELLENT. Many thanks! Hi Sarah! I'm visiting from Encourage One Another Wednesday...All of the appetizers here look amazing ... and very practical as well! I have made the Cranberry Meatballs before and plan on making again for Christmas... they are so yummy! Thanks for sharing! All of these look delicious. Thanks so much for sharing with Adorned From Above’s Link Party. Have a great week. Everyone of these look delicious! I especially am liking the cucumber sans! Each of these look delicious! I love making appetizers and these are wonderful choices. One that I make is take ripe olives and stuff and cover with a flavored cream cheese (like salmon). Grind up peanuts or pecans and roll the olives in the crumbs. A tasty treat! Thank you for pulling all of this together in one place! This is the third year in a row I have came to this site for ideas for my Christmas Party.